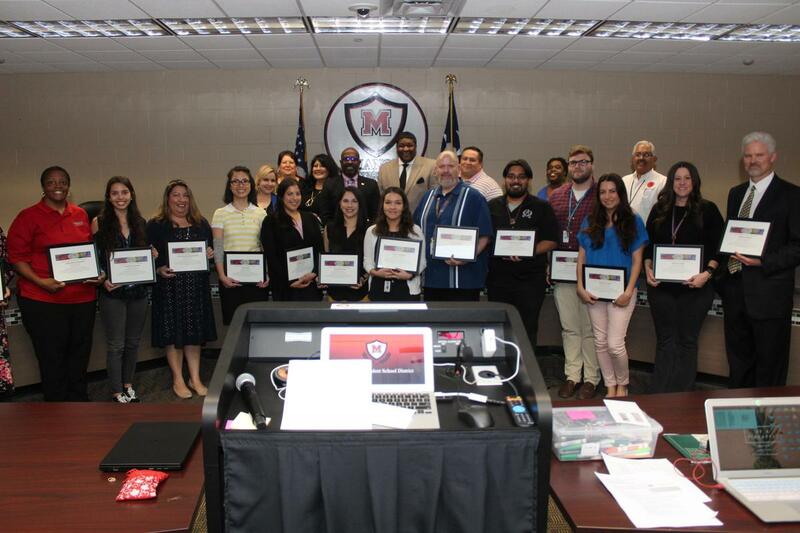 As part of Manor ISD continued effort to celebrate the hard work that is being done throughout the district, each principal was asked to nominate one teacher from their campus to be recognized at the March school board meeting. Congratulations to all those chosen! Mrs. Martinez is an exceptional 1st grade bilingual teacher. She is an influential leader on her team and on campus. She leads by example and is always eager to learn from others. Her attention to detail and the ability to differentiate instruction for all students makes her a highly effective teacher. Mrs. Martinez embraces a warmth and kind personality which is inviting to students and truly demonstrations that she not on cares about their academic growth, but their personal well-being. She has a profound sense of dedication to planning, and providing instructional guidance with great fortitude. She has served as an ideal educator for teammates new to the campus, and is always one to share ideas and best practices, along with make recommendations which support balanced instruction. Mrs. Martinez actively communicates with the parents of her students via her team’s letters, email blasts, class Dojo system, and her positive reinforcement parent phone calls. She routinely engages her class parents when the opportunity arises and is quick to check in on how to better serve her students and to offer assistance when needed. Mrs. Martinez, participates in campus and district leadership opportunities. She is openly collaborating and working in tandem with the team to bring a unified dynamic to the grade level for the campus. She is always willing to help where Mrs. Martinez is needed with Literacy Night, Multicultural Night, Dr. Seuss Reading Contest and Dr. Seuss door decorating contest. Ms. Vega is very supportive and very passionate about her student's success. Not only has she helped with student's academic growth, but also social and emotional growth. Simply the best inclusion teacher I've had the privilege to work with! Ms. Vega has transformed our thought process on how to serve students with special needs. She has been instrumental in collaborating with teachers to serve our students and be in compliance with student IEP's. She has built great relationships with the students and teachers. Ms. Vega has built great rapport with parents by having an open line of communication. She addresses any concerns with parents and is very transparent. Ms. Vega is extremely flexible and willing to go above and beyond when necessary. She is always willing to step up to ensure our students are covered based on need. This her first year teaching a testing grade and her students are making great improvement. Ms. Barajas is always willing to grow professionally. She is always looking for ways to help her students improve. She has analyzed data and used the information to change her way of teaching to where her students have grown 40% in a short amount of time. Ms. Rosales is very flexible as well as a great role model for her students. Ms. Rosales-Richard is a pioneer to support learning of her peers in early literacy by providing PD to her colleagues. A Let's Talk feedback from a parent: Thank You Mrs. Roxanne Rosales-Richard. I would like to take the time to praise Mrs. Roxanne Rosales-Richard for all of the reading instruction she has given my daughter. I feel Mrs. Roxanne Rosales-Richard has played a large roll in my daughters developed interest in learning to read and wanting to read on her own. Although Ms. Rosales-Richard is a kindergarten teacher, she supports the testing grades in regards to tutoring supervision. She was super instrumental in opening Lagos Elementary as well as supporting her team as the team lead this year. Ms. Bui is the model of a lifelong learner, extending a helping hand to build teacher capacity and improve student performance across content areas. Ms. Bui recognizes the importance of building positive student relationships, how those relationships foster academic progress and performance and models this daily in her work with students and teachers. Ms. Juarez engages all of her FAC students in academic activities that help them meet their goals and love learning. She focuses on the whole child and invites each child's family to be part of the learning process. Ms. Juarez shares her knowledge of her students abilities and goals with inclusion teachers. She participates in all campus activities and is always willing to offer ideas and feedback regarding instruction and differentiation. She has a positive attitude and is always willing to serve her students and her community. Ms. Juarez has a professional and respectful relationships with each of her student's parents. She participates in PTA as well as Fine Arts events. She attends campus and district activities. She has extended customer service to all parents. She has worked to break down language barriers in order for parents to understand special education services so that they can advocate for their child. Her skills as an inclusion teacher have been invaluable to all all OME teachers and students. Ms. Juarez is an excellent employee who exhibits excellent character. She stays after and tutors a single student, she pulls difficult kids from other teachers classes to help out while having a super challenging group of her own. She is wonderful to work with and is easily approachable when asked questions about anything. Ms. Davis was instrumental in organizing UIL for our campus! Ms. Davis was the first teacher to step up to provide professional development in a faculty meeting. Her presentation set a high bar for others to follow. Ms. Martinez sets the bar very high for her students. She expects every child in her classroom to perform to the best of their abilities every day and creates systems in her classroom that promote this growth. Ms. Martinez is an active member of our campus and takes leadership roles in helping to support other teachers on her team and throughout the campus. She is a positive person, always looking to find the good in any situation. Ms. Martinez works tirelessly to build relationships with her families and invites them to be engaged members of their child's educational experience. Ms. Martinez is always willing to show-off the systems and academic procedures to anyone that might need new perspective or help with achieving their goals. Ms. Barrerra works closely with our resource/inclusion teacher as well as our GT/AIM teacher to ensure she is meeting the needs of all her students. When given a challenging student, she builds a rapport with them first before attempting to engage them in learning. The relationships she establishes with students leave a lasting impression. Ms. Barrerra serves as the team lead for third grade and collaborates with teachers across grade levels. She works closely with the instructional coach to ensure the instructional design of her lessons and the lessons of her peers are rigorous and meet the needs of all students. Prior to being a teacher for MISD she served as both a mentor and a volunteer. She continues this spirit of giving by supporting campus and community events. Ms. Barrera served on our UIL coaching team. She stays late to plan and is willing to do anything that is asked if it will the students of SGE. Mrs. Hernandez teaches a 2nd reading class to our ELs who did not pass STAAR. She utilizes MVRC and other techniques provided from the bilingual department. Mrs. Hernandez has helped teachers to better understand TELPAS and the importance of TELPAS. She is also very involved with building relationships with students. Mrs. Hernandez is always in contact with parents. She has purchased clothing and food with her own money for students in need. Mrs. Hernandez has stepped in with our TELPAS testing and it is a complete turn around from last school year. Mr. Sheffield puts in a lot of hard work with students. SS Scores have gone up a minimum of 25 points. He is a team player and works well with other teachers. He always provides support for peers when needed.He is one of the leaders on the SS team and participates on the Teacher Review Team for TAP. He has great classroom management. Mr. Sheffield has great rapport with parents and works with students after school. He understands that to make an impact, you need to lead. Mr. Shelton who has been with Manor ISD in his first year is an exceptional teacher. He engages his scholars daily as they learn about historical life in United States. From his detailed highly rigorous and relevant lesson plans, his influence on exceptional academic growth of scholars is evident in his scholars’ outcomes, products, and projects. With his colleagues, he is a consummate professional. He is always willing to assist in any way as needed. Also, it is shown in his interactions during Professional Learning Communities, Grade Level Meetings, etc. His positive outlook adds to campus culture. He is a solution seeker and problem solver. He makes parent contact and through his examples of parent contact, the construct of engaging his parents and connecting to his scholars learning, highlights the importance of academic and social emotional growth for all scholars. Mr. Shelton simply, cares. He is always willing to assist in any way as needed. Also, it is shown in his interactions during Professional Learning Communities, Grade Level Meetings, etc. His positive outlook adds to campus culture. He is a solution seeker and problem solver. Mr. Hernandez keeps the rigor and holds students accountable. He started the MECHS Student Government Association and does a lof of SGA events with parents. He engages in meaningful afterschool events. This teacher's influence on the exceptional academic growth of students is constantly demonstrated in how she meets the students where they are and guides them to various levels of success in their progress, while increasing their confidence in all things math related. Ms. Shaw has significantly enriched the professional learning of colleagues and improved campus culture by collaborating with others to make sure students and campus needs are being met, sharing valuable ideas and plans that contribute to the overall success of this campus, and embracing and sharing in the diversity that exist here. Ms. Shaw goes above and beyond with parent satisfaction by communicating with parents about student participation and progress, and always being available to address parent concerns. She's also always willing to get involved in our efforts to engage the community in our recognition events. She works hard to ensure that when parents arrive to after school engagements, they are properly assisted. Ms. Roberson is a true advocate for our students in making sure they are progressing academically, and always thinking of innovative strategies to help increase student success! Ms. Roberson has shown tremendous growth in her assessment data over the past few months, and this is due to her increase involvement in PLC collaborative sessions, taking initiative to learn new effective teaching strategies, and analyzing the data to ensure the skills among her students were addressed. Ms. Roberson also serves as a Basketball Coach and the students had an exceptional winning season! She also uses this platform to help mentor the young ladies. Ms. Roberson is a Team Player, and very supportive of the campus mission in serving our students through Mustang Pride! As an experienced teacher that is new to MNTHS, Coach Coward has embraced PBL in his classroom to design relevant and novel projects for his scholars. He has also done a fabulous job as head coach of our Volleyball and Lady Titan Soccer programs. Coach Coward works closely with our special education inclusion staff as well as with our administrators and Secondary PBL Coordinator to bounce ideas and explore new ways to help his scholars explore history through PBL. Coach Coward looks for college partners and internship opportunities for our school and through coaching has also rallied parents to have a very successful fundraiser campaign! He is a strong advocate for his scholars and his programs.